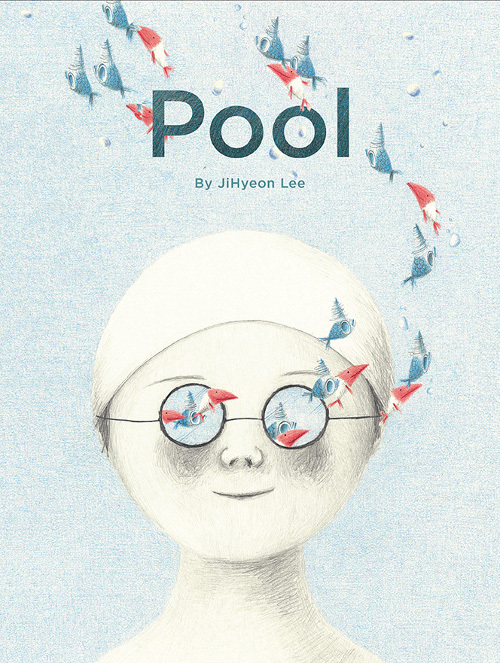 I’ve got a review over at BookPage of JiHyeon Lee’s debut picture book, Pool, released by Chronicle this past week and originally published in South Korea in 2013. 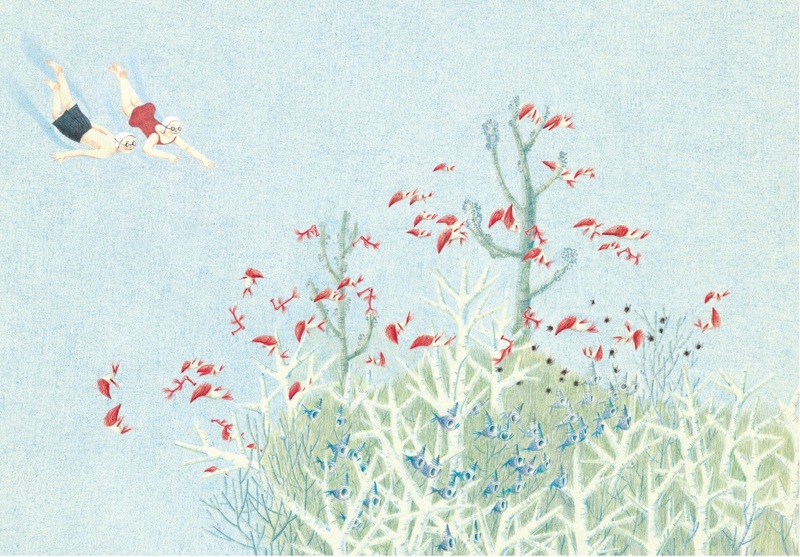 Here’s the review if you want to read all about the book, and below is a bit more art. 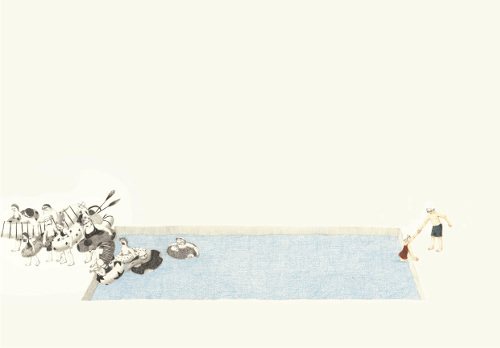 POOL. Copyright © 2013 by JiHyeon Lee. English translation copyright © 2015 by Chronicle Books LLC. All images here reproduced by permission of the publisher. 1) My stomach flu is gone. 2) I had a birthday this week, and people I love spoiled me. 4) I’m actually in Wyoming as you read this for a children’s lit event. Maybe next week I can tell you about my trip. It’s my first time in Wyoming. You can maybe assume right now at this very moment that my view is spectacular. 7) The countdown-to-end-of-school has begun. My kicks – snow on Mother’s Day (Denver), a new 3 in 1 printer (crossing fingers I can figure it to my computer), and my kids. Pool looks like a book you want to dive into. Love the watery illustrations. Happy Birthday, Jules. Hope it was fabulous. Glad you are better. Such a week you had and now to be in Wyoming. I can just imagine the scenery. 1. More stuff left my house through a garage sale. 2. Reading Songs of Willow Frost by Jamie Ford for bookclub. 5. The appreciations given to the teaching staff this week at school for Teacher Appreciation Week. 6. Finding baby house wrens (sadly only one made it out of the nest). Good morning, Imps and swimmers from JiHyeon Lee’s Pool! Happy Mother’s Day to all of the parents. Jules: HAPPY BELATED BIRTHDAY! I’m so glad that you are feeling better. Have fun on your trip. Jone: Wishing the best for the surviving house wren. 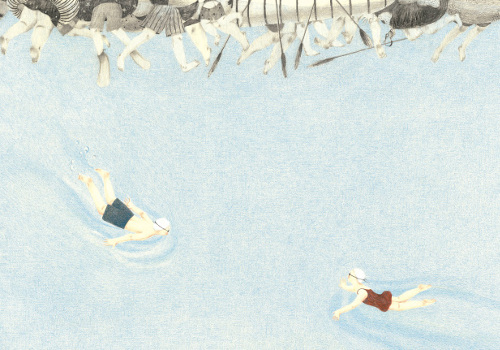 This book makes me want to go swimming. Jone, I cant wait for my roses. Law, kicks 3 and 7, for real. 5. Huge success for a fundraiser that is so important to my family and my community. 6. Saw Whiplash last night and loved it. 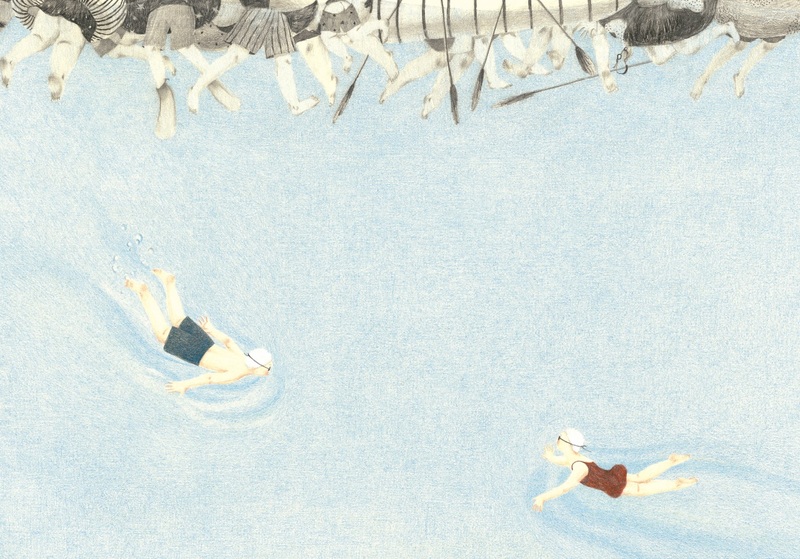 Lovely and perfectly timed illustrations! Perfect for this warmer weather! Jules – enjoy Wyoming – it looks amazing! So glad your flu is gone. What’s the novel? Jone – wasn’t yesterday an amazingly beautiful day? Perfect for dinner outdoors! Hooray for the Poetry Postcards and a good week. LW – Perseverance is one of my most favorite things to see in life, along with Agreement and Decisions. Sounds like you had an awesome week. Moira – Those homemade cards were perfect! Glad you had such a success with the fundraiser. 1) Finally saw the movie Center Stage. I love dance movies. 2) Started reading Echo last night. 3) Working in the garden while Daisy and a friend kept me company. 4) Dinner and catchup with another friend over spicy boiled crawfish – yum and fun! 5) Beer tasting in Hood River yesterday with friends – Oregon in springtime is unbelievably beautiful. 6) Breakfast this morning with another friend – shrimp and grits and bacon, holy moly it was good! 7) Last night’s fun soccer game. We lost by 1 goal, it was a clean, competitive, friendly game. 7.5) Time today to work in the garden with Daisy. Happy Mother’s Day to all the moms and to everyone with moms to love! Jules- A children’s lit event in Wyoming? Tell us more please! I have never been to Wyoming but I love children’s lit events! And so glad you bug is gone and yes- do tell us the novel! Snow on Mother’s Day!? Boo! Jone- Dinner outside is the bets. I am so glad it is time for that to happen! Moira- I’m so glad your fundraiser was a success. There is alway so much put in to these events- glad it was work that was worthwhile! Rachel- I haven’t heard of Center Stage. I think I may have to look in to it! 1. Funny and super sweet Mother’s Day cards. 2. Our first HOT day of the season. 3. Steak on the grill for dinner. 4. Reading The Night Gardner. It had fallen off my radar and Jule’s post last week reminded me to read it. Holy Cow- it is so good and not even a genre that I normally enjoy. 5. A new barre class that I am loving. 7. Time today to take a nap. Moira: Congratulations on the successful fundraiser! Stacey: See above. Also, yay for taking a nap. Hi, you all! More soon. I got back very late last night. I’m so glad you stopped by, though, and I’ll be here later to revel in your kicks. Hello to whoever left the first comment, but there’s no name! Jone, I love my poetry postcard. … And best of luck to those baby birds. We have one in our front yard too. LW: Is it an interview WE can read?! Moira: Thanks for the reminder to see Whiplash. Happy Mother’s Day to your mother — AND you. Rachel: The novel was Station Eleven. Good stuff, but very bizarre to be reading in an airport (given the plot). … Every time I read your kicks, I want to visit Oregon. Stacey: I read that The Night Gardener has been optioned for a movie! Also, I get to meet Jonathan next weekend, which I’m excited about. … Congrats on your warmer weather. Oh, and the Wyoming event. I hope to write about it soon. Stacey – if you are a fan of dance, and particularly ballet – you will probably enjoy Center Stage. Steak on the grill and hot weather – great combination! Jules – Yes! Come visit! But come visit in summer or early fall, that’s when the weather is the best. Right, Jone?